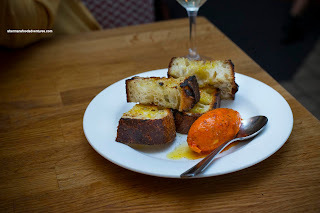 So we got right down to it starting with the Grilled Sourdough with 'nduja with caramelized onion butter. First off, the bread itself was excellent on its own with an airy chewiness that was appealingly dense in some parts. The crunch of the toasted crust was nutty and firm. Drizzled with olive oil and lightly salted, there was enough flavour even without the butter. Oh, the butter, so rich, fatty, sweet and spiced. This was addictive and although we had so much more coming, we finished the bread. At first glance, the Bagna Cauda with various crudites looked like a light health-conscious dish (still healthy if you are looking it from a paleo perspective!). Well, the buttery hot anchovy and garlic bath made this super decadent. 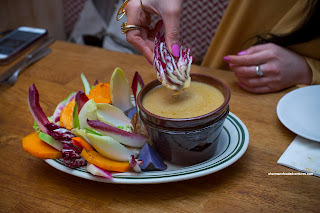 Dipping these fresh and crunchy (except for the parcooked squash) veggies (endive, radish, squash, beets and radicchio) into the bath yielded briny saltiness that was indeed garlicky and rich. So yum. 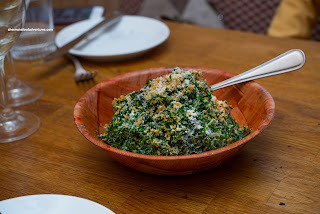 Again, this richness was exemplified by the Kale with lemon pepper dressing, pecorino and pangrattato. This would probably even be appealing to those who hate salads and kale for all that matters. Aggressively dressed, the wilted kale was merely a vessel for the impactful dressing that was indeed peppery and tangy. Providing a toasted crunch, the pangrattato also added nuttiness. The salty cheesy factor was there thanks to the ample dusting of pecorino. Something as simple as Burrata atop Salt Spring olive oil and house vincotto was one of our favourite dishes of the meal. 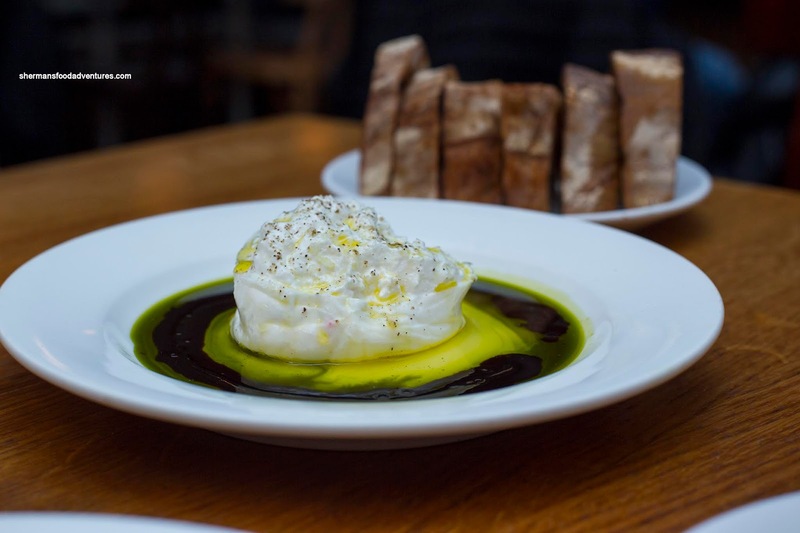 Supremely fresh, the creamy burrata was texturally and taste-wise on point. This would've been great with just the aromatic olive oil even without the sweet vincotto. However, soaking it up with the bread wasn't necessarily a bad thing either. 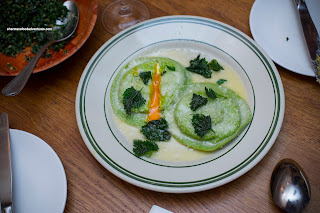 Moving onto some pastas, the Nettle Raviolo with runny egg yolk, ricotta, mint, pecorino, stracciatella and crispy stinging nettle was really good. As clearly shown in the picture, the free-range egg yolk was perfectly runny while the pasta itself was firmly al dente. Flavours were subtle except for the cheesiness. Best part was the egg yolk (combined with the cheese) as it became the de facto sauce. 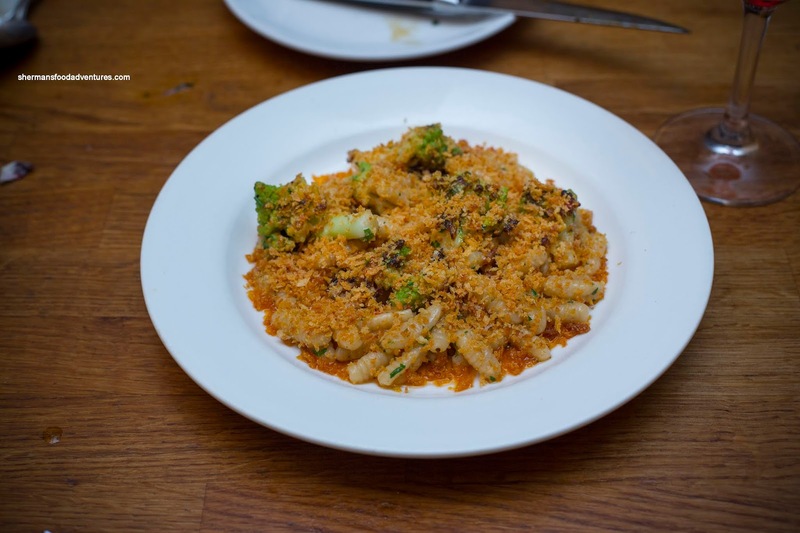 Covered with pangrattato, the Cavatelli came with romanesco cauliflower,chili and garlic. The pasta couldn't have been any better texturally. There was an appealing chewiness that had a great mouth feel. On top of that, the tomato sauce was mildly tangy with a noted spice. As mentioned, it was liberally topped with pangrattato which added an impactful crunchiness. 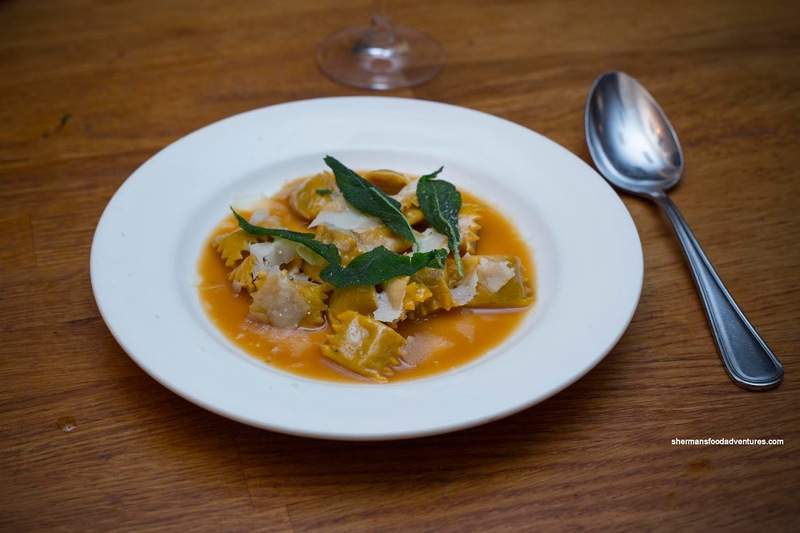 Continuing with pasta, our absolute favourite of the bunch was the pork, veal and chicken Agnolotti with roasting juice, pepe nero and crispy sage. Again, the texture of the pasta was spot on being thin and gelatinous buttery chewy (if that makes sense). 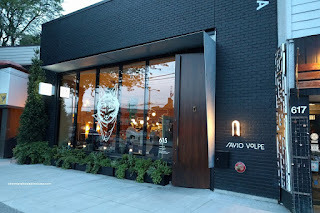 Inside, the veal was full of meatiness and umaminess. The silky jus was reduced enough to be slightly thick and concentrated. This further amped the meatiness of the pasta. I only wished there was more crispy sage. 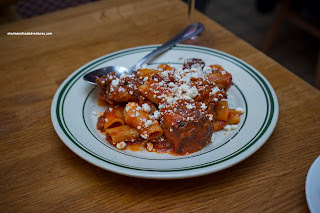 Not particularly photogenic, the Sunday Sugo with beef braciola, meatball and pork ribs was rustic and comforting. Prominent amongst the al dente tubes of rigatoni, the abundance of meat made this robust and filling. Ribs were fall apart tender while the meatball was naturally textured with little filler. The tomato sauce was tangy and chunky being the right amount without drowning the pasta. 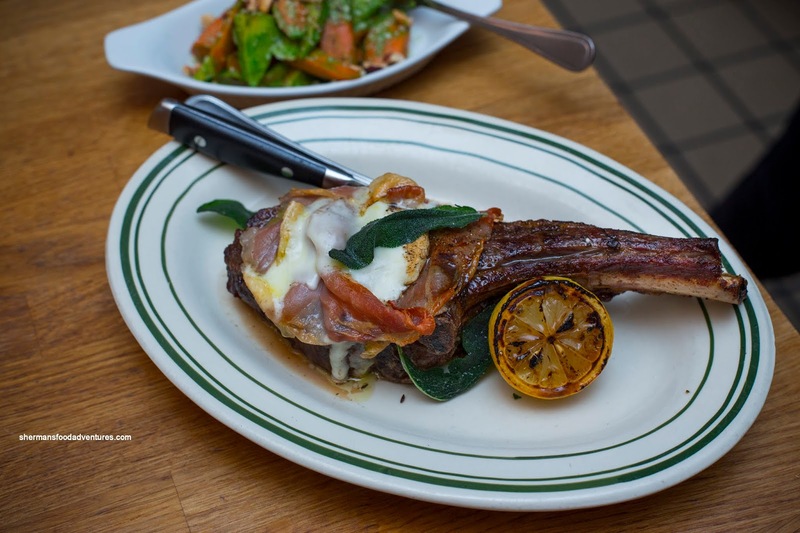 Their wood-burning oven is one of their signature features and the meats are some of the highlights of the menu. 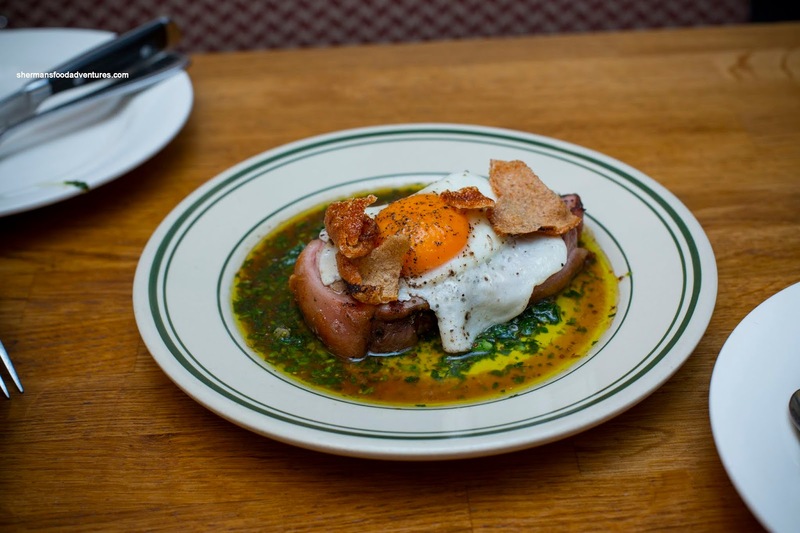 We tried the Suckling Pig with fried egg, cracklings and salsa verde. Stunningly beautiful from the deep hue of the free-range egg and the green from the salsa verde, it could've been almost taken as green eggs and ham. But the pork was far from ham as it was fatty and tender with a nice rebound. Cracklings were airy and crunchy while the salsa verde added a bit too much grease to an already rich dish. Behold, the Grass-Fed Veal Chop topped with prosciutto, taleggio and sage was both majestic and outstanding. The meat was tender and moist while completely taking on the properties of the intense heat of the oven. Literally topping it off, the salty prosciutto added salty depth while aromatics from the taleggio really came through as well. For the sides, I found the simple Grilled Cabbage with chopped grabiche (eggs, pickles, capers and parsley) and lemon to be my favourite. Charred just enough, the cabbage was smoky without being completely burnt. It still retained a crunchiness that was necessary as soft-wilted cabbage would've been less appealing. I found the grabiche (thankfully this was not the creamy type) to be impactful with the usual herbs, but the amount of lemon helped bring the dish to life. 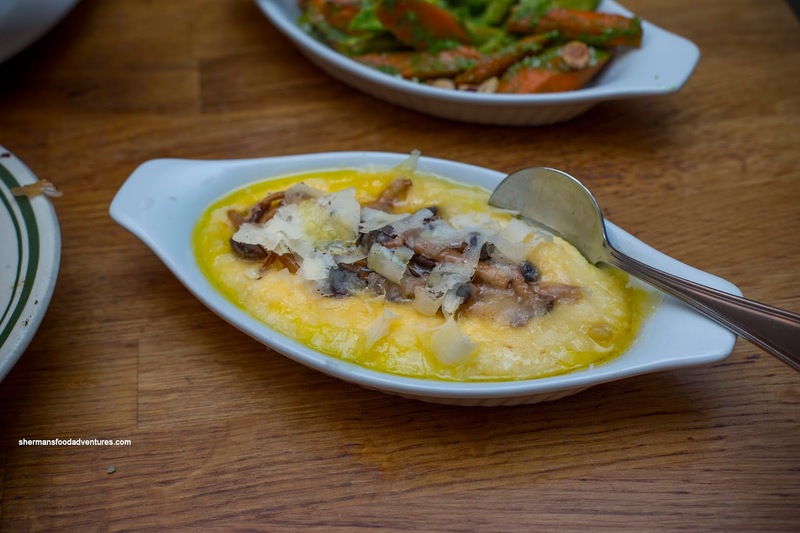 Also very good was the Polenta with velvet pioppini mushrooms, ash roasted garlic and grana padano. Smooth and creamy, the polenta still had some bits here and there. Good contrast of textures. On top, the cheese and mushrooms predictably added salty nuttiness combined with buttery mushroom essence. 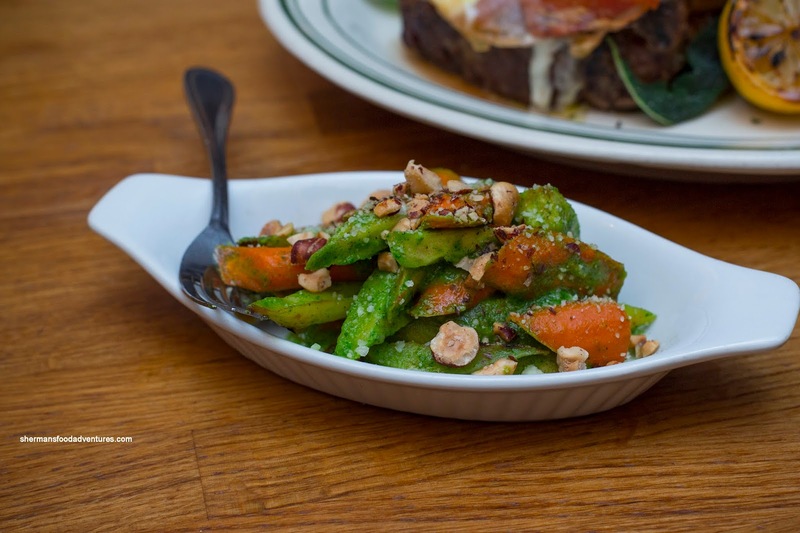 We had one more side in the Roasted Parsnips and Carrots with stinging nettle and mustard green pesto as well as hazelnuts. Exhibiting a similar flavour as the raviolo, the bright and slightly sharp pesto balanced out the sweet earthiness of the parsnips. 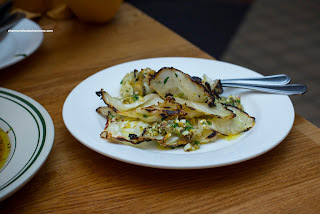 About those parsnips, they were cooked all-the-way-through but maintained a firmness. I also enjoyed the crunch from the hazelnuts. 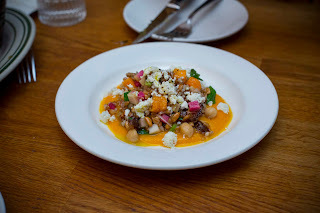 Not a side, but more like a salad, the Farro with squash, chickpeas, dates, pine nuts, ricotta salata and mint was stunning in terms of colour. It also ate quite well too. 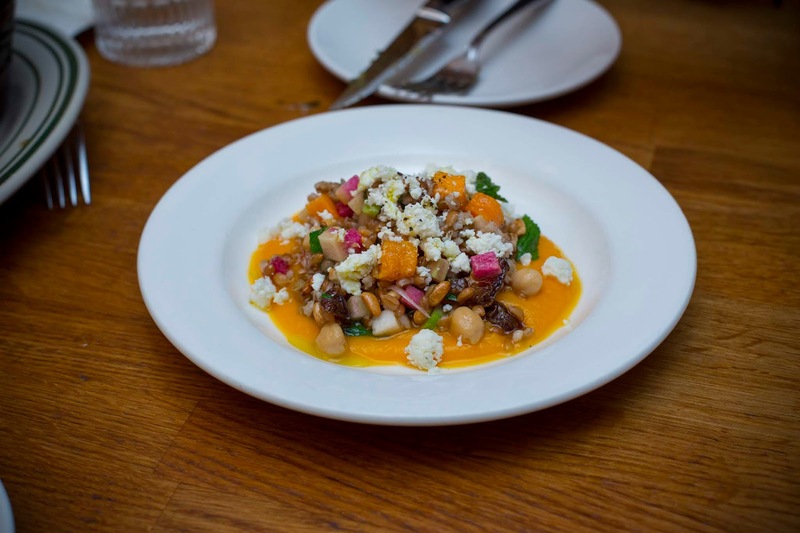 What made this salad of sorts was the sweet sticky dates. Little bursts of intense sweetness intermittently mixed with nuttiness, cheesiness and earthiness created a unique flavour profile. Due to the squash, there was more than one layer of sweetness, but they were different. Loved the mint on the tail end of the flavours too. 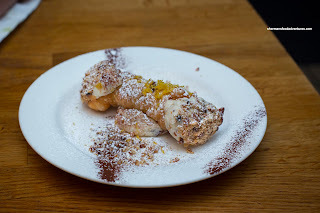 Of course we had to get dessert as well with 3 selections including the Cannoli with ricotta, citrus, cocoa and hazelnuts. Okay, I've had a quite a few cannolis and this one has to be one of the better ones. The best part was the pastry shell itself as it was firm but still exhibited a light crunchiness. The filling was also very nice with a lightly sweet creaminess that was still rich. As much as it was just a touch on top, the grated lemon rind added brightness at the end. 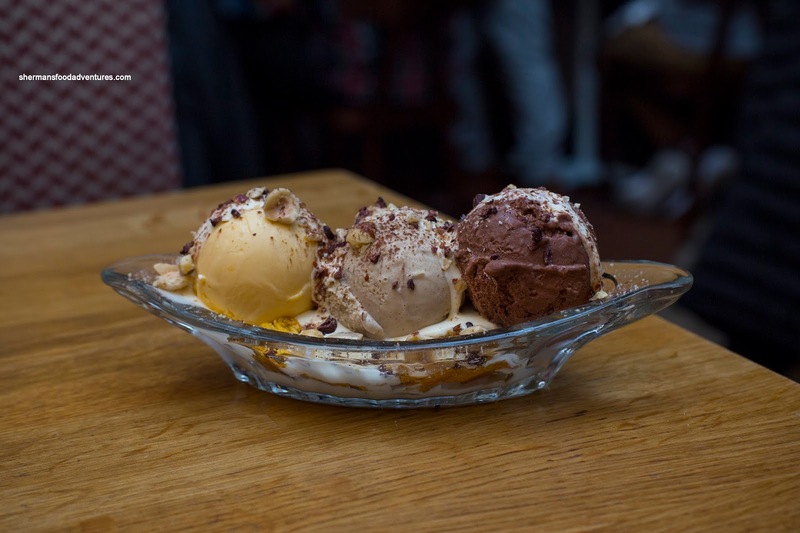 Consisting of 3 large scoops, the Tiramisu Sundae featured house-made gelato flavours - zabaglione, espresso and chocolate hazelnut on top of corn sponge cake, mascarpone and marsala sprinkled with cocoa and hazelnuts. So rich and creamy (especially for gelato), these were consistent texturally throughout. Flavours were bang on with the combination of all 3 scoops emulating a tiramisu and with the sponge cake underneath, I didn't mind this over a regular version! 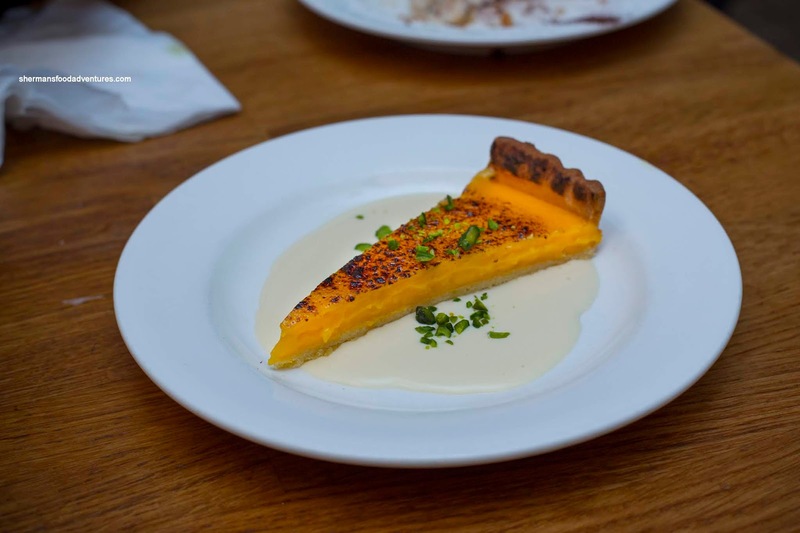 Our last dessert was a classic Meyer Lemon Tart atop crema and sprinkled with Sicilian pistachios. Consistent with the other desserts we had, the lemon tart was balanced and texturally on point. I found the lemon curd to be tangy and just sweet enough. Lots of natural lemon flavour. Although the bottom of the tart was soft, the edges were firmly crunchy and aromatic. This was a fine way to end a feast where we tried nearly everything that needed to be tried (except for the Vitello Tonnato which we've had before and it's excellent!). Except for a few minor things here and there that partly could've been attributed to personal tastes, the food we had at Savio Volpe was on point and delicious.